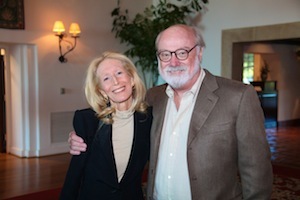 Author and guest speaker Jane Heller and her husband, Michael Forester. This stewardship event featured local author Jane Heller, whose trademark humor and irreverence kept the audience entertained. Her thirteen novels of romantic comedy, nine of which have been sold to Hollywood for movies and television, are now entertaining readers around the world. All guests received a signed advance copy of Heller’s latest non-fiction work, You’d Better Not Die Or I’ll Kill You: A Caregiver’s Survival Guide To Keeping You in Good Health and Good Spirits. “The Chairman’s Council Reception provides a wonderful annual occasion to honor and thank our key stakeholders in a personal way,” said Rick Keith, Executive Director of the VNHC Foundation. “The financial support and commitment of Chairman’s Council members make it possible to provide the highest quality home health, hospice and related services that enable us to be there when the community needs us most. In addition to hearty laughs, guests enjoyed fine wine provided by Kunin Wines and hors d’oeuvres at the Montecito Country Club and also learned more about the history of their support and what it has meant to patients and families served by VNHC. 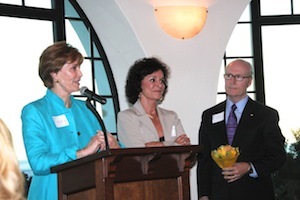 VNHC Boardmember Jane Habermann (speaking) and VNHC's Foundation Executive Director Rick Keith honor Marie Ann Straight (center) for her years of dedicated volunteering for Visiting Nurse & Hospice Care. Visiting Nurse & Hospice Care is the leading nonprofit provider of comprehensive home health and hospice services in Santa Barbara. Visiting Nurse provides high quality, comprehensive home health, hospice, and related services necessary to promote the health and well-being of all community residents, including those unable to pay. It serves all of Santa Barbara County, including Santa Ynez and Lompoc Valleys. Established in 1908, Visiting Nurse is one Santa Barbara’s oldest nonprofit organizations. For more information on Visiting Nurse & Hospice care, click here or call (805) 965-5555.